Shift-clicking on automation sets the Edit Filter automatically and makes the automation visible for editing. Because Cakewalk has multiple automation options, it’s not always easy to choose the right tool for the right job. For those who are new to Cakewalk by BandLab — and for Sonar veterans who may have missed out on some useful features — let’s delve into some of Cakewalk’s less common automation functions. Track automation lanes are convenient, but if you have lots of automation lanes and expand one lane’s height to do detailed work, all other open automation lanes for that track will adopt the same height — so now you need to click the lanes’ plus and minus symbols to show and hide the lane you want to see. And to see other tracks, you’ll need to do a lot of vertical scrolling if the automation lanes take up most of the Track View. A simple solution is not to use automation lanes. Instead, keep them folded inside the track, optimise the track height, and view the automation data within the clip by using the Edit Filter to select the desired automation type. However, with multiple automation lanes folded up into a Clip, and the Edit Filter set to Clips, you’ll see a large number of ghosted nodes that clutter the clip visually. There’s an easy way to hide these: click View / Display and untick ‘Show Ghosted Data’. If you want the reverse — see the nodes, but not the Waveforms — tick ‘Show Ghosted Data’ and untick ‘Display Clip Contents’. But there’s a more streamlined way of working with automation inside a track. If the Edit Filter is set to Clips, and you hover over ghosted automation while holding the Shift key, you’ll see a tooltip that shows the automation type. If you then click while the tooltip is showing and the Shift key is still held down, the Edit Filter changes automatically to that automation type (whether clip or standard automation). The automation data then becomes visible, and you can edit it. Because that automation type is selected in the Edit Filter, you can’t edit other envelopes accidentally. This same technique lets you delete ‘orphaned’ envelopes caused by creating envelopes for a plug-in that you later remove — the plug-in may be gone, but its associated envelopes will still be there. Shift-click on the envelope to make it visible, right-click on it, and then choose Delete Envelope. The last time we covered snapshot automation was almost eight years ago, and there are some additional techniques worth exploring. Snapshot automation is not a dynamic process; rather, it captures parameter settings at a particular ‘now time’. 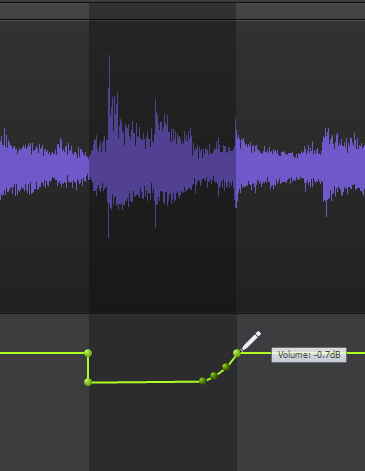 This makes it easy to do a quick level change, drop the EQ amount in a track to open up space for another instrument, and so on. There are two snapshot automation techniques: per parameter, and multiple parameters. The per-parameter snapshot places a node on the corresponding automation envelope if such an envelope exists. If not, it creates the envelope and places a node. This works with mixer controls (level, pan, send amount, etc.) as well as ProChannel modules. Several snapshots have been added to change levels on a tambourine track. There are a few cautions. Because a snapshot creates a parameter jump, you can place a node only where the automation envelope displays a dashed line. To convert a solid automation line into a dashed line, right-click on it and choose Jump. Also, the Write mode needs to be set to Touch (set this in the Track’s Inspector). Finally, you can place a node with a different parameter value than the existing automation only if a node precedes the new snapshot anywhere in the automation line. Otherwise, taking a snapshot will adopt the current automation setting. To take a snapshot of an individual parameter, place the ‘now time’ where you want the automation node, then adjust the parameter to the desired value. Right-click on the parameter’s control and choose Automation Snapshot (I recommend against ticking Automation Write Enable; it’s not necessary, and may cause issues). This works whether the automation is in a lane, or folded up and appears superimposed on a track. The Edit Filter doesn’t have to be set to the parameter you want to automate, but the visual feedback of doing so is helpful. After reducing the volume in the selected region by click-dragging down, Alt-click to draw a smooth transition with the pencil.The procedure for creating a snapshot that encompasses multiple parameters is more complex. You would use this if you want, for example, several tracks to change volume instantly and at the same place, such as when switching from intro to verse. Again, these changes have to occur in a place where any automation lines are dashed, not solid. With a track that has the focus but is not selected (so that the track number itself isn’t lit but the track shows in the inspector), Ctrl-click in the Edit filter to select the automation you want to write — for example, Volume. 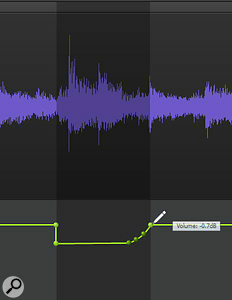 Using Ctrl-click creates a Quick Group for all the tracks so that they’re all set to Volume automation. 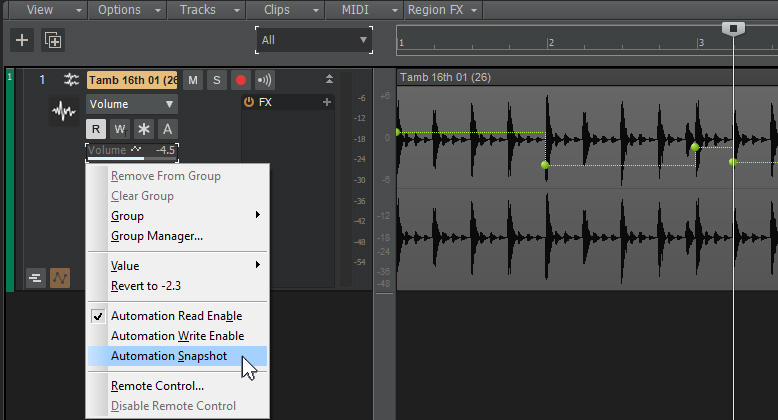 In that same track’s Inspector, click on the Track tab to reveal the track parameters. Ctrl-click on the Write Mode drop-down menu and select Overwrite, then enable automation Write for the tracks where you want to create a snapshot. Make sure the desired track parameters are set for Automation Write Enable. After the nodes are in place, you might want to change some of the jumps to curves for smooth ramps up or down from one snapshot to another. 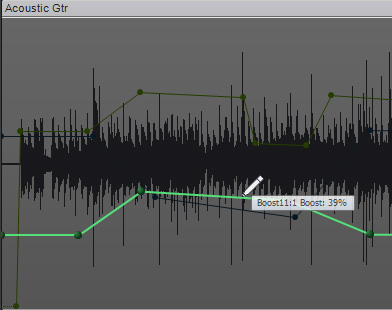 Invoking Clip Automation from a track’s Edit Filter allows drawing gain and pan changes within individual audio clips, and velocity within MIDI clips. It’s useful when you want a complex automation pattern (like rapid ‘stuttering’) controlled by an overall envelope based on standard Automation Lanes, and for making fairly detailed edits rapidly. Also, because this is not a DSP-based process, using clip automation with Groove Clips retains their stretching characteristics. There’s a Sonar shortcut mentioned in the July 2016 issue to make clip envelope changes quickly, but let’s explore it further. The basic technique is to use the Smart Tool to drag over the part of the clip (below the header) where you want to change the clip envelope. Then move the cursor over the clip header, and the cursor changes into a line with up/down arrows. Click-dragging up or down creates two nodes at the boundaries of the region you selected; increase or decrease the envelope level by dragging up or down respectively. 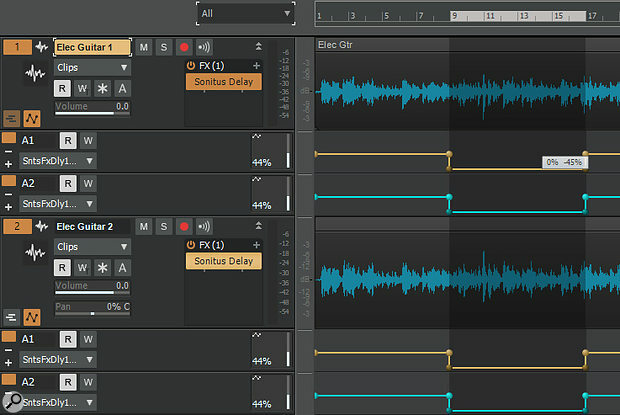 The Mix parameter for both channels of two Sonitus Delays have been brought down, simultaneously and identically, to dry mix only with one click-drag. You can use the Move Tool instead of the Smart Tool, which is handy if you already have the Move Tool selected for some reason, like moving individual clip automation nodes or lines. Unlike the Smart Tool, though, you need to drag across the timeline to define the region because dragging within the clip will move the envelope. Furthermore, this technique also works for any kind of automation. If the automation appears in an Automation Lane, click just below the top of the selected Automation Lane (not the clip handle) and drag. One potential drawback is that raising and lowering a section of an envelope may create an abrupt transition with adjoining envelope sections. No problem: hold down Alt, and the Smart Tool turns into the Draw Tool (this doesn’t work with the Move Tool). Now you can draw to smooth out the transition. Also consider setting the Draw Tool to line instead of freehand. Also note that as soon as you define a region, this selects the associated track. If you then select more tracks whose Edit Filters show automation, editing one track via the click-drag method will edit the other selected tracks. This technique is handy with doubled parts on individual tracks, where you want an identical, abrupt automation change reflected in two different tracks. They can even be different parameters. There is one caution: if no track is selected, dragging across the timeline selects all tracks. Editing the envelope for one track will edit the automation for all tracks whose Edit Filters are selecting automation, if the automation (either in a clip or in an automation lane) is visible. To prevent accidental editing, it’s best to select the track you want to edit the automation of before dragging across the time line.